2015 was a tumultuous year – many upheavals, but all ended well. 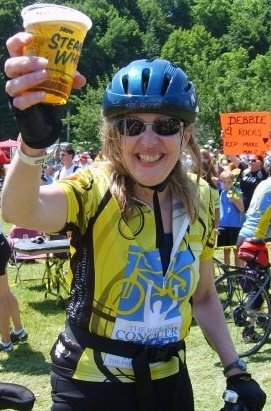 Friends fought but won against deadly medical challenges. Our daughter and her husband moved to Montreal – but settled happily in a lovely new condo. And it was the year of bittersweet farewells. Friend and teacher, Rosemary Aubert, retired her novel writing course at Loyalist College in Belleville. And in November, Anne Hillerman gave the sad news that this year’s Hillerman Conference would be the last. Both have been a source of joy and new friends for many years. This was my first year as a “real” writer. In other words, a traditionally published novel writer. Though many of my short stories have appeared in print, like most authors, my secret longing was always to have a novel to put on my book shelf. 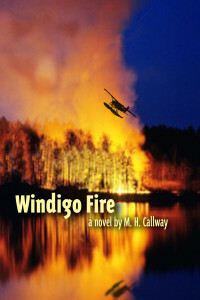 Windigo Fire was released late in 2014 by Seraphim Editions, a leading Canadian literary publisher with a 20+ year history. 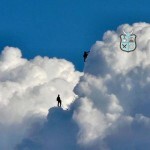 I’m delighted to be a Seraphim author: I still have to pinch myself sometimes. My publisher’s email of acceptance truly changed my life! WF got great reviews and was a finalist for the Arthur Ellis Award for Best First Novel. Huffington Post Canada put WF on its fall list of Books for Book Clubs and Margaret Cannon of the Globe and Mail dubbed me ” a writer to watch”. 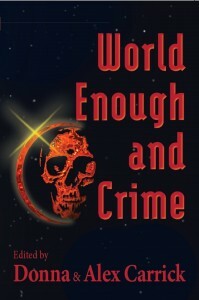 And as it that wasn’t enough, my short story, “The Ultimate Mystery” in Carrick Publishing’s anthology, World Enough and Crime, was short-listed for the prestigious Derringer Award. Heady stuff! 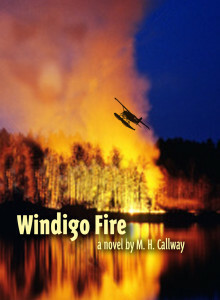 I spent most of this year promoting Windigo Fire via readings organized through our group, The Mesdames of Mayhem , the Crime Writers of Canada (thanks Nate Hendley and Sharon Crawford! ), the Writers Union and Noir at the Bar (thanks Tanis Mallow and Rob Brunet!) I also gave several workshops on how to get traditionally published to writers’ groups in Hamilton, Sudbury and Toronto. Now that my friends, Cheryl Freedman and Caro Soles have retired, our national conference, Bloody Words, alas, is no more. So I tried out three new conferences: two on the west coast and one in Sudbury. The Galiano Literary Festival is one of Canada’s best kept secrets, held in an idyllic setting on wildly beautiful Galiano Island. There a debut author, such as myself, can mix and mingle with the nation’s leading writers – even Elizabeth May, the local MP and leader of the Green Party! Left Coast Crime was held in Portland, Oregon, this year, entitled “Crimelandia” in honour of the hilarious sketch show, Portlandia. Portland is an amazing city: the best microbreweries in North America, a fab retro city centre called the Pearl District and a light rail transit system that actually works! I had the honour of presenting Windigo Fire at the New Authors Breakfast and of moderating a panel on plot twists, which included friend and Canadian crime writer, Barbara Fradkin and fellow debut author, Ray Daniel. LCC was a fine mix of cozy and noir, both sides having great respect for one another. I had a wonderful time hanging with fellow Canadians, Barbara, Robin Harlick, Linda Wiken and Vicki Delany. As you can see, conference seminars largely lost out to food and beer. What really made LCC a winner was hitting it off with the Noir crowd, including two great Canadian writers, E.C. Brown and Sam Wiebe. 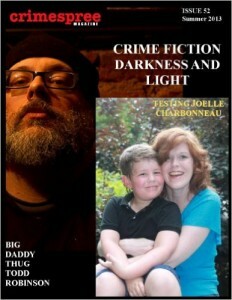 If you haven’t read either of these guys, you’re missing some of Canada’s best crime fiction. Many thanks, too, go to friendly Americans Brian Thornton, Kate Dyer-Seeley and Hilary Davidson, terrific writers all – just don’t play poker with Brian! In June, I headed north to Sudbury’s literary festival, Wordstock. 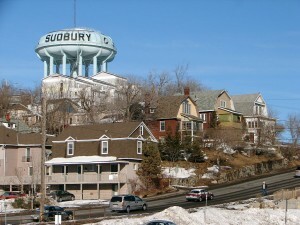 Most southern Ontarians regard Sudbury as a remote northern outpost accessible by bush plane or snowmobile, but in fact, it lies a mere four hours north of Toronto via a modern expressway. That’s a lot closer than either Ottawa or Montreal. Presumably north of Barrie, Torontonians believe one crosses a Startrek-like quantum barrier into a wilderness empty of cars yet full of bears and moose. Once again I had the privilege of meeting some terrific authors: poet Melanie Martila, radio personality and crime writer, Scott Overton and Laura E. Young, who has penned a fascinating history of Great Lakes swimmers, Solo Yet Never Alone. 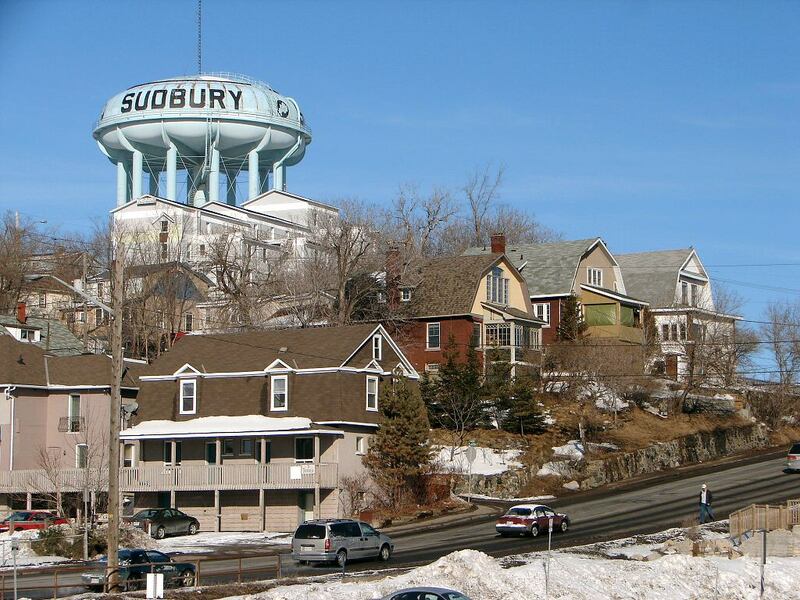 Sudbury was a breath of fresh air quite literally. No smog, two pristine lakes and a water tower that looks very “War of the Worlds”(see photo above). Imagine, too, a book festival where the mayor officially welcomes the authors – Toronto wasn’t Ford-free yet – and where everyone enjoyed a performance by two of Canada’s comedy treasures: Terry Fallis and Sandra Shamas. While busy promoting, I did manage to do some writing. Stumbling across an unofficial memorial garden near our cottage was a gift I couldn’t ignore. 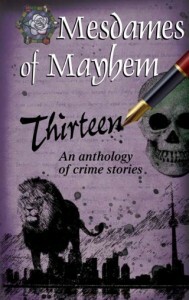 My suspense novelette, “Glow Grass” drew on this and it’s one of the 15 stories in The Mesdames of Mayhem’s latest anthology, 13 O’clock (Carrick Publishing). 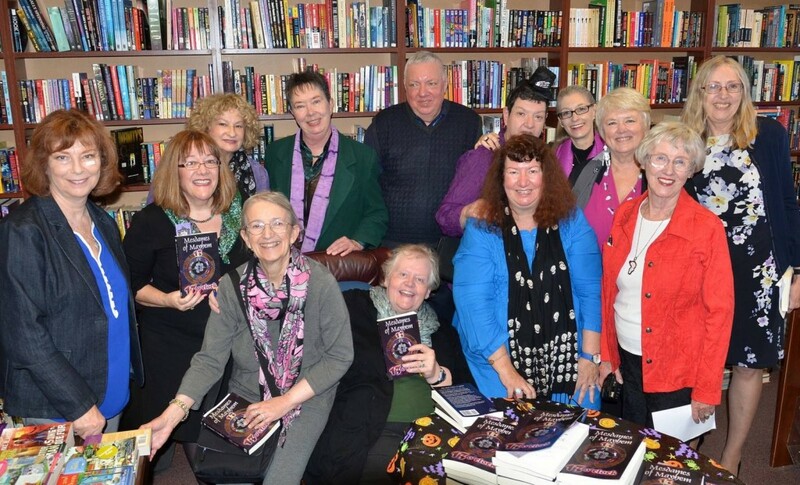 We Mesdames had a wonderful time promoting 13 O’clock via our cyber launch in September and in October, partying in the real world at our favorite bookstore, Sleuth of Baker Street. As the year faded, it was time to refocus. I spent time in October learning Word Press so that I could take control of my website. My previous site required a software engineer to update it, so I scrapped it in favour of WP, the results of which you see here. My take: WP is easy to start, but time-consuming and challenging to master. Yet totally worth the time input! In November, my friend, TO Poet, led our group of NaNoWriMo Misfits back to basics: writers write – go figure! NaNoWriMo is short for National Novel Writing Month and it challenges writers to produce 50,000 words in one month. Churning out this volume felt overwhelming at times, but I pulled it off. My second book in the Danny Bluestone series, Windigo Ice, took shape. More importantly, it kick-started my creativity: I have since then sketched out two noir stories. NaNoWriMo is a lifesaver for any writer who needs to refocus. 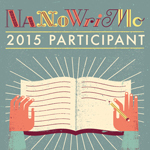 (Read my previous blog, “Riding the NaNoWriMo Tiger” for the deets). The year ended with another serious medical challenge for a fellow writer. Her crime writer friends got together and wrote a “chain story” to cheer her up. I was honoured and delighted to be part of the gang. The only proviso: total license. What lurid and outrageous imaginations were on display: cross-dressing, cute dogs, dragon ladies, Russian mafiosos, purple exploding dildos, oh, my! Most importantly, we made our friend laugh. The Mesdames’ third anthology contains 17 twisted tales (ha!ha!) of crime starring our animal friends. Angels or demons? Includes stories by 12 established crime writers as well as three newcomers to the genre. I indulged my love of noir to create my thriller novelette, “Snake Oil“. Strangely, many readers get freaked by the snakes in this story, even tough noir male authors who don’t bat an eye writing about splatter murders and disembowelments. Go figure. “Snake Oil” is based on an actual experience a friend of a friend (yes, really) when she was a young real estate agent. Unbeknownst to her, the house she was viewing was inhabited by serious reptile fanciers. Definitely an odd subculture, aspects of which appear in the story. Bella Bates is in desperate financial straights. Making it as a real estate agent is her only way back to her preferred lifestyle. Her son-in-law warned her about weirdos hidden behind closed doors, but so what? She’s tough, she’s got what it takes. Or does she? Warped tales of time and crime! 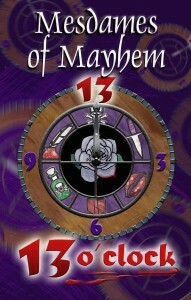 Fourteen authors contributed to 13 O’clock, the second anthology by the Mesdames of Mayhem (Carrick Publishing). The book contains my dark suspense novelette, “Glow Grass”, inspired by an unofficial memorial garden we stumbled upon while hiking in the woods. “Glow Grass” was a finalist for the 2016 Arthur Ellis Award for Best Novella! A young woman returns to her derelict family cottage abandoned since her father died in a mysterious accident. Is the secret cemetery in the woods meant for her? A collection of stories by some of Canada’s leading crime fiction authors, including the runner-up for the 2015 Arthur Ellis Award. 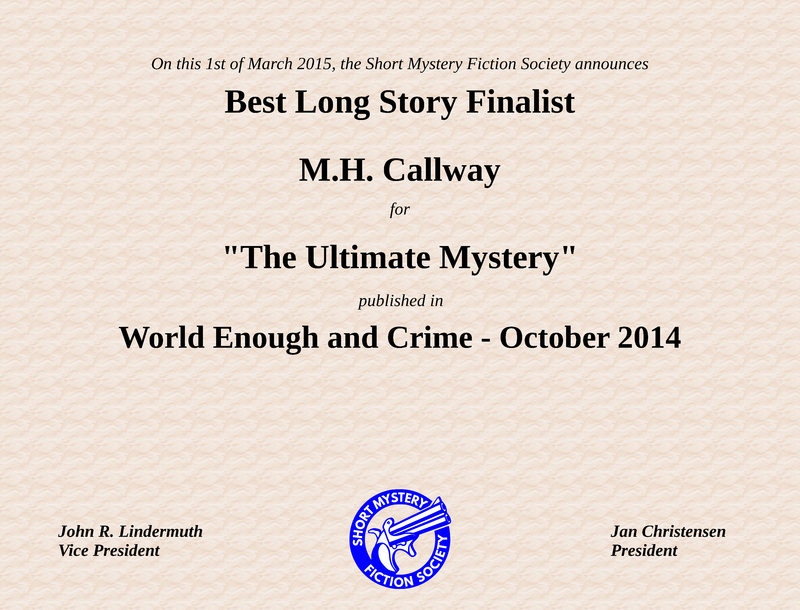 My cross-over tale, “The Ultimate Mystery“, was a finalist for the prestigious 2015 Derringer Award. Maria questions why her world forces her and her mother into slavery. At the same time Lucy, who lives alone with her mother on an isolated prairie farm, also begins to question the rigid rules governing her life. Dastardly tales by thirteen of Canada’s leading crime fiction authors. Two stories were nominated for the 2014 Arthur Ellis Award for Best Short Story and one for the 2014 Derringer prize. My comedy thriller story, “Amdur’s Cat” introduces the hero from my learner novel. I liked Benjamin Amdur too much to leave him in the filing cabinet. “The Lizard” appeared in Crimespree Magazine, Issue 52 and was reprinted in Kings River Life Magazine, August 2014. 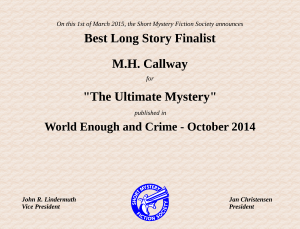 It also won the Bony Pete Award in 2012 for Best Short Story. A desperate mother tries to save her drug-addicted daughter using the death of Mr. Kim, their beloved family cat, as leverage, but she’s way out of her depth in the criminal underworld. My friends and I regularly run through Mt. Pleasant Cemetery. Why, you may ask? Well, traffic is light, the roads are paved and in good repair. The hundreds of species of trees provide shade in summer and in winter, its hardworking staff plow and sand the roads way before Toronto’s regular streets. I first saw Mt. Pleasant Cemetery walking across the ravine bridge on St. Clair Avenue West. New to Toronto, my curiosity was piqued by what appeared to be small Greek temples set in distant greenery. 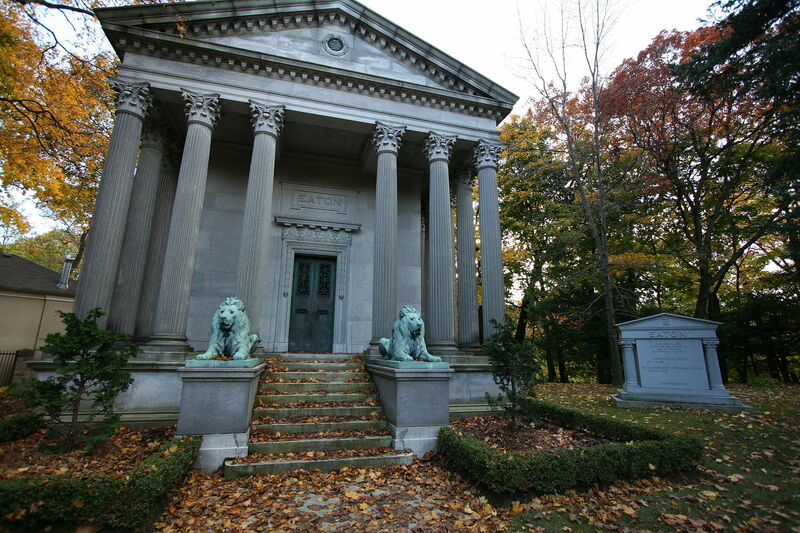 These mythical structures proved to be the mausoleums of worthies such as the Eaton family, tombs that wouldn’t be out of place in a vampire movie. Our futures can indeed prove strange. I had no idea then that I would end up living next to the cemetery, nor that my friends and I would run and bike through it almost daily. For the record all you bikers and hikers, once around the cemetery is about 7 kilometres. Mt. 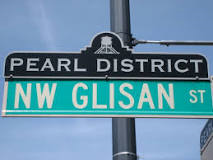 Pleasant was established in 1873 on a 200-acre farm outside the city limits. Initially, only Roman Catholics or Anglicans were allowed to be buried here, but times fortunately have changed. Its 168,000 permanent residents now reflect Canada’s multi-cultural heritage in nationalities and faiths. Which brings me to the resting place in the photo above. 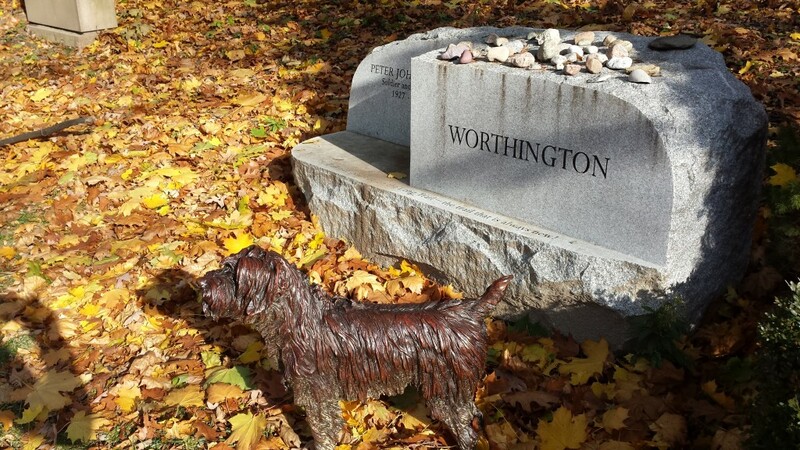 My running buddy and I spotted the little brass dog that guards the grave of Peter Worthington, founder of the right-leaning Toronto Sun newspaper and well-known journalist. 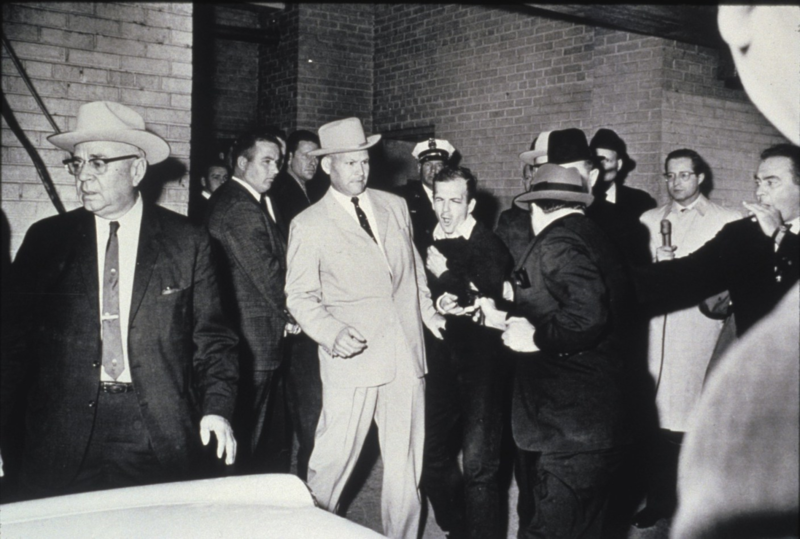 What people may not know is that he was an eye witness to the assassination of Lee Harvey Oswald by Jack Ruby on November 24, 1963, as depicted in this world famous photo below. A far sunnier and uplifting fact is that Peter Worthington was a strong believer in animal welfare and a long-time supporter of the Toronto Humane Society. We like to think that the little brass dog was once his pet who now stands by him forever. November comes across an “also-ran” month: somber Remembrance Day on Nov 11th, serious charity drives (take a bow Movember) and almost unfailingly dismal weather. A bridge of sighs between the glories of fall foliage and the sparkly explosion of Christmas. So don’t just sit there: bloody do something! For the last two years, my friend and fellow author, TO Poet, has encouraged me to join him and his friends who are burning up their keyboards during this 50,000 word marathon. TO Poet has ridden the NaNoWriMo tiger no less than six years running. So I jumped in feet first with little – let’s be honest – no preparation! What is National Novel Writing Month? NaNoWriMo was created in San Francisco, July, 1999 by Chris Baty and 21 of his writer friends who challenged themselves by trying to write a novel in a month. The next year 140 signed up. Through the power of the internet, by 2008 more than 200,000 novelists, experienced or emerging, young or adult, had joined in. In 2015, participants span the globe in places as far away as central Russia and Micronesia. Oh, well, I was always late into a trend. How did y’all keep going? TO Poet set up a Facebook page for the NaNoWriMo Misfits, our team name. He kept us inspired with daily pics, such as this one on the left. We logged on every day to report our progress: peer pressure is a compelling motivator. And coffee. Lots and lots of coffee. At a write-in at TO Poet’s home, I discovered that his coffee mugs rival goldfish bowls. Why embark on this marathon? Why not? As many first-published authors discover, promotion is up to you. I’d spent the past 12 months promoting Windigo Fire, through conferences, meet-ups, bookstores and libraries. 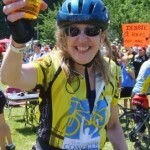 On my own or with our group, The Mesdames of Mayhem, I literally did hundreds of events. I needed to do get back to doing what authors do: write! Not that my keyboard was idle. 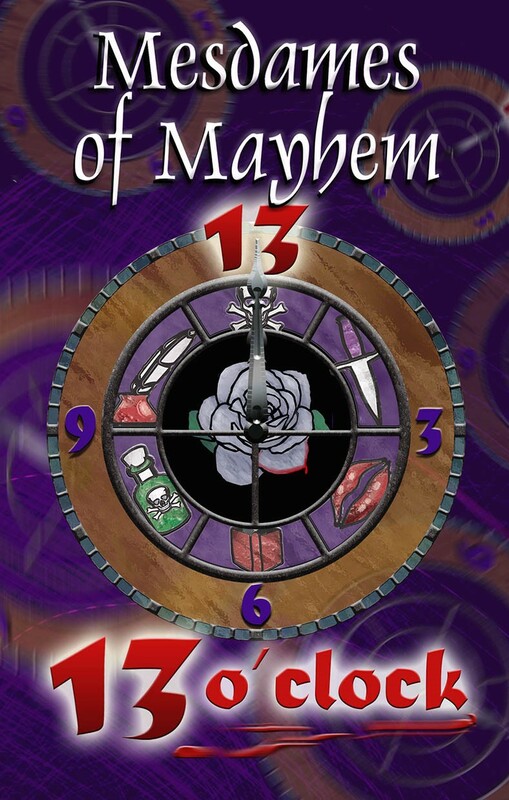 I’d completed my suspense novelette, “Glow Grass”, for the Mesdames of Mayhem’s second anthology, 13 O’clock. But now I needed to work on the second novel in the Danny Bluestone series, Windigo Ice. I ran across some early chapters of Danny’s second adventure that I’d written before Windigo Fire was accepted by Seraphim Editions. So much had changed after Windigo Fire was finalized, that they weren’t useable. But they inspired me to get moving! What plan / approach to use? As a former scientist and MBA’er, I take a quantitative view of life. I knew that an overwhelmingly large project can be managed once it’s broken down into incremental steps. That translates to approximately 1700 words over 30 days to reach the required 50,000 word count. I did a couple of test runs on a new suspense story I’m writing and found that 1700 words per day was doable. November 1st dawned and I was off and writing! How did NaNoWriMo go? Did you make the word count? I did indeed make the word count: 50,048 to be exact. I kept a tally of my daily word count on a trusty Excel spreadsheet. Here are the stats: I averaged 1700 words per day fairly consistently, with a range between 1600 to 2200 words. My max output happened on the last two days as I neared 50,000 words where I wrote 2200 and finally 3300 words to get done! For me, NaNoWriMo was a lifesaver. I refocused on writing, which is what authors do, right? To my surprise, I found time in my daily life to do it since writing became a real priority. Mega thanks go to TO Poet and team mates, Lizzie, Heather, October, Betty, Cathy and the Misfits for unfailing support and inspiration. Meeting the word count meant turning off the editor in my head. I tend to be a deliberate, measured writer in terms of word-smithing, so NaNo was immensely freeing. I got to know my characters again, resolved tricky plot problems, churned out fun action sequences and created an encounter between Danny and Santa, the escaped villain from Windigo Fire, that was a joy to write. I have several ideas for the core theme(s) and a goodly chunk of words to draw on – or to store for Book 3 or 4. A thriller usually runs between 80,000 to 100,000 words, so that means I’m halfway there. Now is the time for hard thought, ie. to put my “plotter” hat back on while surrendering my “pantser” plumage with a sigh. And the wording will be refined and re-refined: I rewrite and revise a lot. For example, I rewrote my novelette, “Glow Grass” twenty times. Most definitely! In an ideal world, I’d have my plot meticulously laid out so I could go straight to work and have a near-ready product at the end of November. But I’m pumped about Windigo Ice, can’t wait to wrestle with its plot and finish writing Danny’s winter adventures. Thanks to NaNo, I’ve rediscovered the joy of writing and I’m planning to be back next year. When I was five, my mother and I drove up to Jasper on what was then a dirt road. Wild bears were plentiful and wandered about freely. We pulled up at a spot where tourists were hand-feeding the bears candy bars. (Even as a kid, I knew that was a Bad Idea!) When Mum didn’t deliver the sugar, a bear thumped on our driver’s window with huge muddy paws. I wrote up our adventure in school and got an A+. A writer was born! At university, I studied science, not English. Tired of academia. I grabbed my doctorate and happily jumped back into the real world, working for a gold mining company and later for the government doing disease investigations. Eventually I studied business and ran my own IT consulting service, all while my husband, Ed and I raised our family of one child and many, many pets. My work was fascinating: I helped investigate a murder, toured the 3000 foot deep Falconbridge nickel mine and even met the Queen of England (though not all at the same time!) Perhaps that’s why I didn’t start writing seriously until 2002. I started out writing short crime fiction. My story, “Kill the Boss”, won first prize in the Golden Horseshoe contest held by Crime Writers of Canada. That gave me a great boost and I went on to publish several more stories in e-zines, print and anthologies. 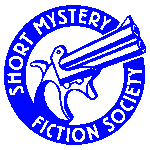 I was thrilled when my story, “The Lizard”, won the 2012 Bony Pete prize and when my experimental work, “The Ultimate Mystery”, was a finalist for the 2015 Derringer prize. But my dream was to pen a novel. I wrote a “learner novel” which now rests in my filing cabinet. Encouragement from a leading literary agent and my writing critique group led me to write a second one. That manuscript was short-listed for the Debut Dagger in 2009 and later for the 2012 Unhanged Arthur Ellis award. My odyssey to publication is a story in itself: I give regular talks about it to inspire other emerging writers. Seraphim Editions published my debut novel, Windigo Fire, in September 2014. It received glowing reviews from the Globe and Mail and was one of Huffington Post Canada’s choices as a Book for Book Clubs. To be short-listed for the 2015 Arthur Ellis Award for Best First Novel was my dream come true! I would not have hung in there without the friendship and support of my two literary critique groups. In 2013, we linked up to form The Mesdames of Mayhem, an autonomous collective of 15 established Canadian crime writers. 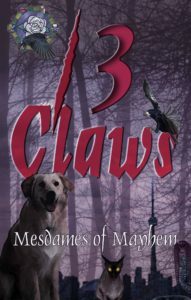 Carrick Publishing has released three collections of our stories, Thirteen , 13 O’clock and 13 Claws. Three stories in Thirteen were finalists for the Derringer and Arthur Ellis awards for best short story. 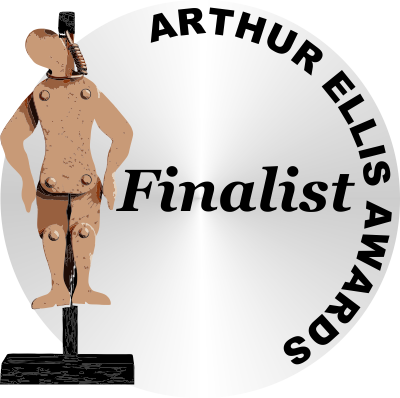 And my story, Glow Grass, in 13 O’clock was nominated for the Arthur Ellis Award for Best Novella. 13 Claws hit it out of the park with no less that four nominations, including the 2018 Arthur Ellis winner. I was delighted to have my long story, Snake Oil, nominated for Best Novella. Last year, two of my short stories were published: “The Cry” in Mystery Weekly Magazine and “The Seeker” in the noir anthology, The Dame Was Trouble. Looking forward this year to finishing Windigo Ice, the sequel to Windigo Fire and to the Mesdames of Mayhem’s fourth anthology, In the Key of Thirteen.